I admit this beforehand: back in the Eighties, while I confess to have listen to many a hair metal band, I never really likes Dokken. 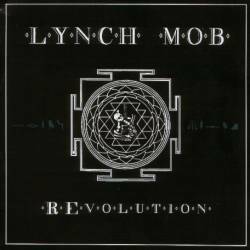 Consequently, I was never interested in his guitarist George Lynch's follow-up band Lynch Mob. Yes, I know it was melodic metal with heavy emphasis on Lynch's admittedly great guitar playing, but when you don't like music like that, you just don't care about it. And that's why the Mob's new CD REvolution won't interest me either. The original idea is interesting: take a bunch of old Dokken and Mob songs and play them in new versions, fit for the new millennium. Sure enough these new versions are crunchier than what I remember having seen on Headbangers' Ball back then, but I bet only fans of Dokken and melodic US heavy metal may buy this. 3 subjective points, for the technical skill, and the opener Tooth And Nail that even rocks for me. By the way, every musician should have the right to play the music they like (even if I happen to not like it), but when you come across am information sheet where bands that try to innovate are called "follow-the-leader" and "corporate crap", I wonder if this is just the proof of a reactionary attitude or just plain and simple jealousy.